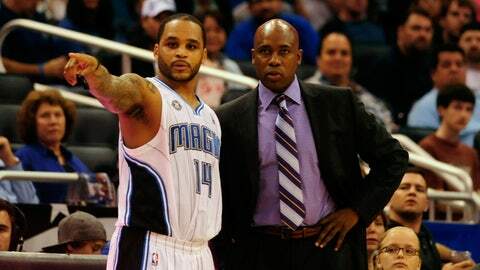 Orlando Magic point guard Jameer Nelson (14) and Orlando Magic head coach Jacque Vaughn talk during a timeout in the first half. ORLANDO, Fla. (AP) — With possibly two lottery picks in next year’s draft, the Orlando Magic clearly have an eye toward the future. Arron Afflalo scored 21 points, rookie Victor Oladipo added 15 points and eight assists off the bench, and the Magic beat the Atlanta Hawks 109-102 on Sunday night to give them back-to-back victories for just the third time this season. Oladipo, the No. 2 pick in last season’s draft, also had five rebounds. "He’s pretty impressive and he’s just starting this thing," Magic coach Jacque Vaughn said. "You get a pulse from him and a sense from him that he wants to do something special." The Magic have shied away from giving Oladipo a specific role. "His versatility is why we’ve stayed away from saying he’s a point guard or a shooting guard," Vaughn said. "He’s a basketball player, and there’s nothing wrong with saying that." Afflalo is no newcomer to the NBA. He entered the league in 2007 with the Detroit Pistons. But in his second season with the Magic, he’s emerged as a star player. His game-time status, due to a turned ankle Friday night, was uncertain. But Vaughn said he didn’t hesitate to play Afflalo after the guard told him pregame that his ankle was fine. "As soon as a player tells me they’re ready to go, then I’m ready to go," Vaughn said. "So no trepidation." Jeff Teague scored 22 points for the Hawks in their second game without two-time All-Star Al Horford, who is out indefinitely with a torn right pectoral muscle. The Hawks were also coming off three straight, grinding overtime games, the latest of which was Saturday night at home against Charlotte. While Afflalo and Oladipo led the way for the Magic, their victory was helped along by the kind of balanced team effort that would please any coach. All five Magic starters scored in double figures, as did two players off the bench. "Across the board, we had a lot of guys contributing," Vaughn said. "That all starts with guys sharing the basketball." The Magic overwhelmed Atlanta both inside and in transition, outscoring the Hawks 46-26 in the paint and 22-13 on fast breaks. The Hawks were coming off three consecutive overtime games, including one just the night before, at home against Charlotte. The Magic led most of the game, and held a 12-point lead several times in the second half. But the Hawks made a fourth-quarter run, eventually taking a three-point lead. But a 9-0 Magic run midway through the final quarter was too much for Atlanta to overcome. "I don’t know when fatigue comes in," Atlanta coach Mike Budenholzer said. "Obviously, we had enough to come back and take the lead. I think you have to give Orlando credit more than anything. They made some plays and their defense picked up and we weren’t able to execute. We couldn’t attack. They got deflections and steals." NOTES: It was Kyle Korver’s 100th consecutive game with at least one 3-point shot made, extending the Hawks’ forward’s NBA record. . The Magic had a season-high 30 assists. . It was the first time this season that the Magic won when the opposing team scored 100 points. Entering the game, they were 0-14 whenever the other team scored in triple digits.